After finishing her degree in Fine & Applied Art at the University of Ulster, Aine went on to do a Masters in Ceramic Design at Staffordshire University, located in the heart of the potteries at Stoke on Trent. After graduating she went to work for Royal Stafford/Poole where she specialized in surface pattern design. 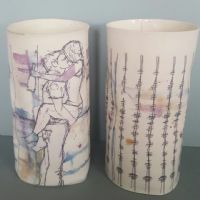 Influenced by industrial techniques and processes she now makes various ranges of ‘illustrated ceramics’.